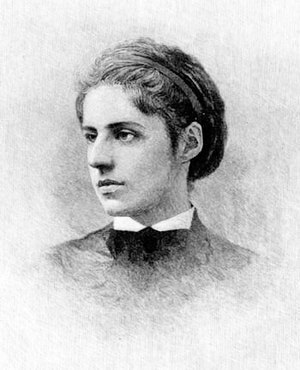 Emma Lazarus was born in New York City in 1849. Today is the 163 anniversary of her birth. She was the middle of seven children born to Moses and Ester Lazarus. The family lived very comfortably in the Union Square neighborhood of the city. They had ties to some of the earliest Jewish American families and were part of the Jewish upper class. She received a classical education and excelled in German and French, she loved to write and translate poems. As antisemitism began to rise in Europe and America, Lazarus became more and more involved in the fight against it. As the Russian Pogroms caused large numbers of Jews to immigrate to the US she became more outspoken on refugee issues. She wrote “The New Colossus” for an auction to help pay for the pedestal for the Statue of Liberty. (France had donated the statue, the US had to come up with the money for the pedestal.) 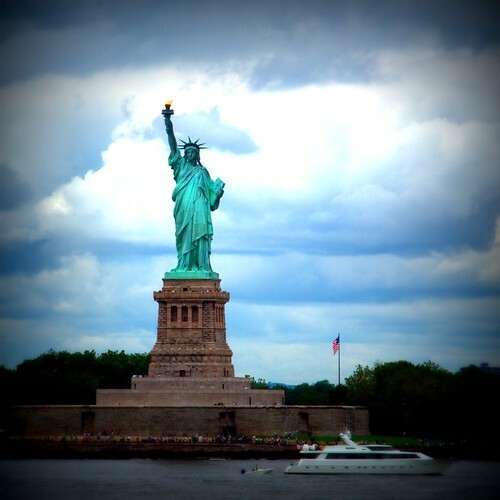 The sonnet perfectly exemplified the Mother of Exiles in the the New York Harbor. The poem was engraved into the Statue of Liberty’s base after Lazarus’ death. She was an accomplished writer, publishing books of poetry, a novel, a play, and several translations for the American market. She sought out Emerson as her mentor, and the two shared a long friendship. This entry was posted on Sunday, July 22nd, 2012 at 8:11 pm	and tagged with Emma Lazarus, Statue of Liberty and posted in American History, Emma Lazarus, History, postaday, Thought of the Day, Today's Birthday, United States, Writing. You can follow any responses to this entry through the RSS 2.0 feed.